For many people, the Yengisar knife is a timeless symbol of Uyghur culture in Xinjiang. While Uyghur knives are still sold, the original town that created them has become a ghost town. 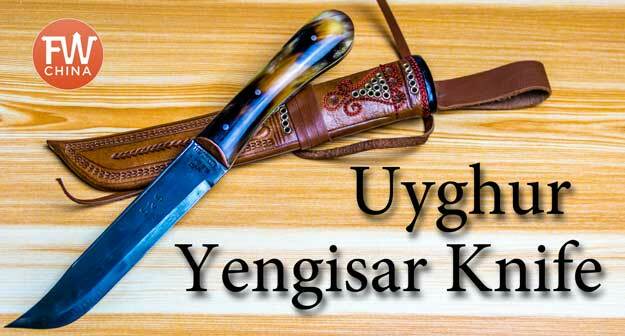 Here’s the story of the Uyghur knife from Yengisar, Xinjiang in China. 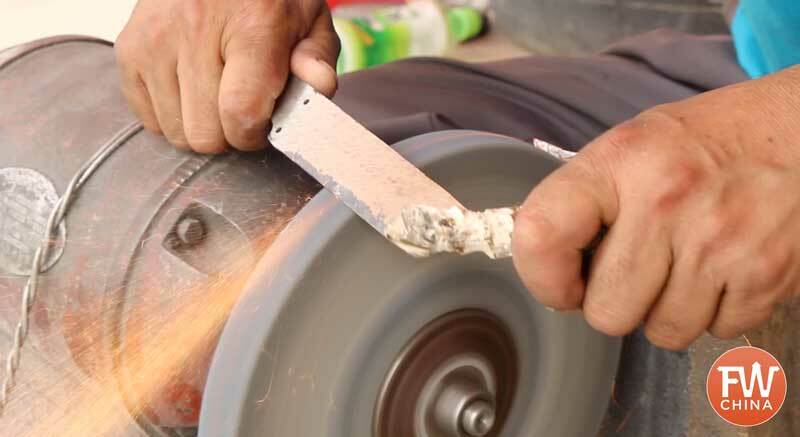 For centuries, the craft of making the Uyghur knife has been an important part of the culture in Xinjiang, a trade skill handed down from father to son. 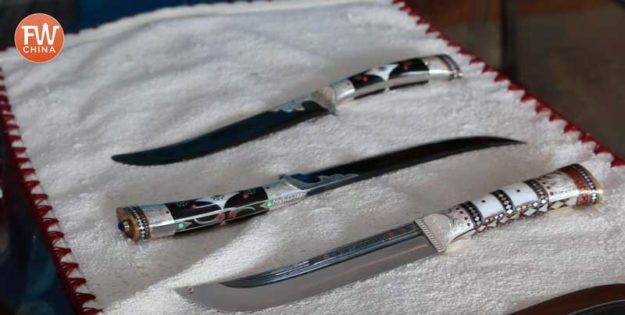 The steel blades of these Uyghur knives are shaped and sharpened by hand and the ornate handles are made of bone, horn, shell and other materials adorned with geometric designs. Because each piece is handcrafted, no two real Uyghur knives are the same. Aside from being a beautiful souvenir though, what makes these knives so special? Why are they called “Yengisar Knives“? And finally, why has this unique handicraft died? These are the questions I set out to answer a few years ago when I visited the International Grand Bazaar in Urumqi and took a trip down to the small, desert village in southern Xinjiang known as Yengisar. If the numerous shops in the Urumqi International Grand Bazaar are any indication, the Uyghur knife is a popular souvenir for tourists in Xinjiang. Knives of all shapes and sizes are displayed in cases and lined up in rows along the wall. Up until this last decade, it was common practice for Uyghur men to carry around their personal knife wherever they went, in part for its practical uses but also out of family pride. Knives were often handed down by fathers or presented as special gifts long before they became a coveted souvenir. All around the Taklamakan Desert in southern Xinjiang, from Kuqa to Kashgar to Khotan (Hotan), families had perfected the skill of knife-making and had become known for their beautiful creations. Out of all these towns and villages, though, none were as well-known for the beauty and quality of their knives as Yengisar. 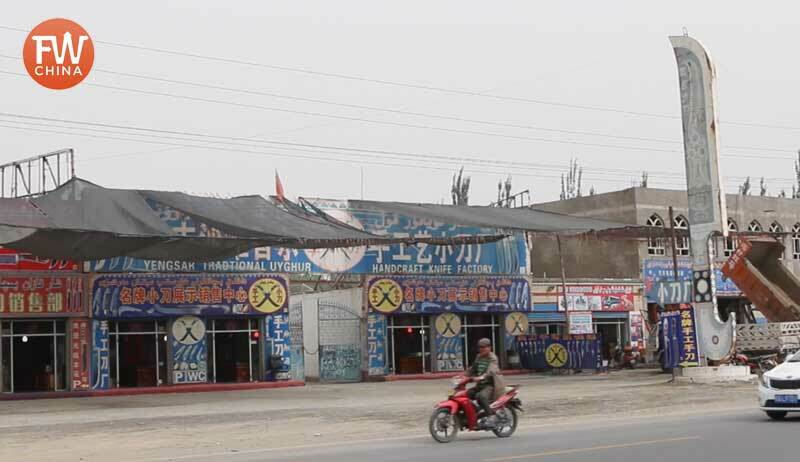 About 70 kilometers south of Kashgar, the small town of Yengisar (英吉沙) sits quietly along the dusty road where cars share lanes with donkey carts. The history of Xinjiang runs deeps in these parts, most of it either forgotten or carefully re-written. The sand and dust covers the footprints of travelers and explorers, rulers and armies that once defined the region. One vestige of the town’s history still clings for life and remains a point of pride for residents: the Yengisar Knife. The Uyghur craftsmen of Yengisar were known far and wide for their knife-making skills. These knives have been exported all across the world with the name “Yengisar Knife” emblazoned on the blade. Like the handcrafted Uyghur paper in Hotan, ask any Uyghur where to find the best quality knives in the world and they will all tell you the same thing: Yengisar. As I stepped off the bus in Yengisar, the dry heat instantly smothered me, a not-so-subtle reminder that this place isn’t far from the massive Taklamakan Desert. Along the main street that runs north-south through Yengisar, you’ll find the normal shops and Uyghur restaurants, but as a foreigner everybody knew where I wanted to go and locals were quick to point the way south. About a kilometer further down, small knife shops began to pop up in a line along the dusty street that at one point used to be busy with Uyghur craftsmen and teeming with tourists. Oversized knife props made of wood at least 3-4 meters tall sat next to the road, acting almost like a monument to the town’s founder. At this point, though, these shops looked like nothing more than an abandoned ghost town. Why would such a bustling town and popular handicraft all of the sudden die? Over the past decade, thanks to knife attacks around China and security concerns here in Xinjiang, the sale and transport of knives has come under heavy regulation. 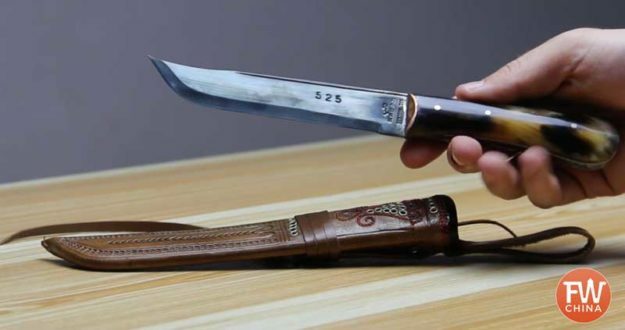 Many personal knives have to be registered based on their length and the Uyghur tradition of carrying a knife on your person was put to a stop. Even Chinese tourists that used to buy knives as Xinjiang souvenirs by the bagful to bring home as gifts are now only allowed one – and even that must be shipped home. All of this amounted to a swift and deadly blow to the Yengisar knife economy. As I walked the row of closed shops, I was desperate to find at least one craftsman who was still working his craft. I began to fear I wouldn’t find one. Thankfully, I stumbled upon Mehmet, a young Uyghur man who was sitting outside grinding away at a metal blade. He smiled as I walked up and seemed genuinely happy to have an excuse to stop working. He willingly showed me around his shop, explaining the art of knife making and how his family has been involved in the craft for generations. The knives that Mehmet showed me were made from recycled steel he had found and forged into blades. 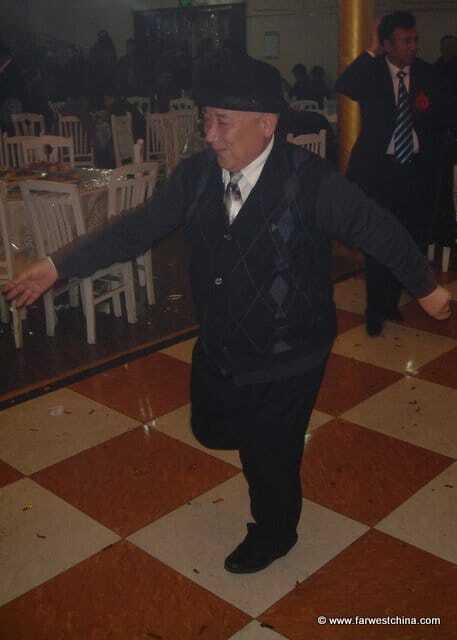 His family clan number and name were stamped on the edge, a sign of its authenticity. 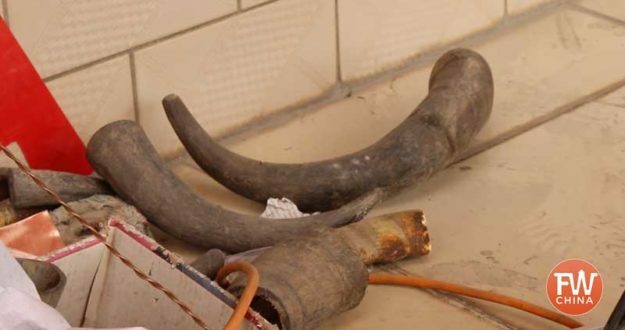 In the corner near the steel scraps were animal horns, bone and pieces of shell that he used to craft the handles. 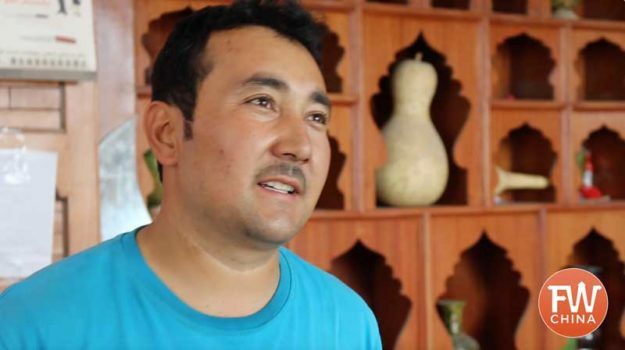 Mehmet shared with me that many of the knives we see at the tourist bazaars in Urumqi and Kashgar – and even some on display in Yengisar – are no longer handmade in town. Most of the blades are now manufactured in factories throughout southern China with handles hastily put together by locals in Xinjiang. He then reached behind him and pulled out a stash of knives carefully rolled up in cloth. These, he explained, were his hand-made knives. I’ve since come to realize that most all Uyghur knife sellers in Xinjiang work this way. When asked about the “real Yengisar knives” they’ll reach under their display cases to reveal a set of knives protected by cloth. They’re more expensive but if you’re looking for the real deal, these are the Yengisar knives you’re looking for. I perused Mehmet’s many beautiful knives but the one that caught my eye was one with a simple but elegant ram horn handle. Prices ranged from 50RMB to 500RMB but I paid about 175 RMB (approx US$25) for my knife. Of course, transporting this knife on a bus or train isn’t allowed in Xinjiang, so how did I get it home? In blind faith I had to pay for both the knife and shipping with no guarantee that it would actually arrive at my home in the capital of Urumqi. Three weeks later, after I had given up hope of getting my knife or my money back, a package arrived at my door. The knife now sits near my desk, a reminder of Mehmet and my wonderful journey to Yengisar. This trip to Yengisar, Xinjiang took place during the summer of 2016. Even at that time, it was obvious that the handicraft was on its deathbed. Unfortunately, over the past few years, the writing on the wall has become reality. Yengisar is a growing city thanks to Chinese migration, but the knife industry no longer exists. Any knife purchased at a shop anywhere in China isn’t made in Xinjiang. This is all the result of increased security in Xinjiang and the attempt by the local Chinese government to erase any unique part of Uyghur culture. It’s sad, but that’s reality. 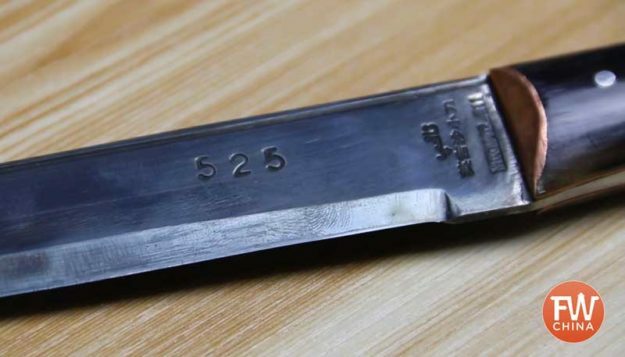 So tight are regulations on transporting or shipping a knife that when I departed Xinjiang in 2018, I was forced to leave this precious knife behind. Getting to Yengisar is thankfully pretty easy and can be done as a day trip from Kashgar. There are buses that run often out of Kashgar’s south station and arrive in a little more than an hour. 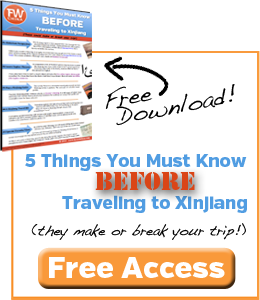 For detailed times and maps, check out the FarWestChina Xinjiang travel guide (download a free planning chapter using this link). The Knives aren’t Authentic: The knives you find at the bazaar or along the streets in Xinjiang are no longer made by Uyghur in Xinjiang. They’re all mass-produced in southern Xinjiang by migrant Chinese workers. You Can’t Take the Knife Home: The hardest part about securing this type of souvenir is getting it back home. Most knife sellers I talk to don’t think it’s possible to ship overseas – or they’ve never done it at least -and I can almost guarantee that it will be confiscated if you try to bring it on a train or bus with you. That leaves just one option: checked luggage on an airplane. Good luck. I’ve been told that tourists are limited to only one knife to take home or they are limited to knives less than 8 inches. The truth is that nobody knows and it’s my guess that the regulations are purposefully vague. Hope for the best but don’t be too surprised if security personnel at the airport question you or confiscate your knife. You wouldn’t be the first. thanks for your article on the dying Trade of the Yengisar KNIVES. I bought your book last year so I Could organise apurely Uighur trip with Ali from Uighur Tours, Kashgar. Of course we went to Yengisar and Hotan. Bought paper as well as 2 knives (22 cm long) In our luggage with took the knives by plane, no questions asked. When the animal market was still close to town. How has it changed now! So much so that it is worth driving the 2 hours out of Kashgar to see the smaller still very original market recommended in your book. Best experience and no tourist in site. I enjoy your videos and your reports, keep them coming, please. Thank you so much, Bettina! I’m glad to hear that your trip went well and the book was extremely helpful ;) For those who may not know what she’s referring to, check out the FarWestChina Xinjiang travel guide at that link. While at the Grand Bazaar my husband bought a beautiful knife and was very proud of it, When we went through security at train station it was taken from him. No one at the shop or train station told us to ship it home. I face the same incident last year. 2 knifes bought at Kashgar were taken when we when through security at Urumqi train station. If i know the situation, I can keep at Urumqi Airport. I am so thankful that I bought my Yengisar knives – my personal knife as well as several for gifts – many years ago before all of the new regulations went into effect. 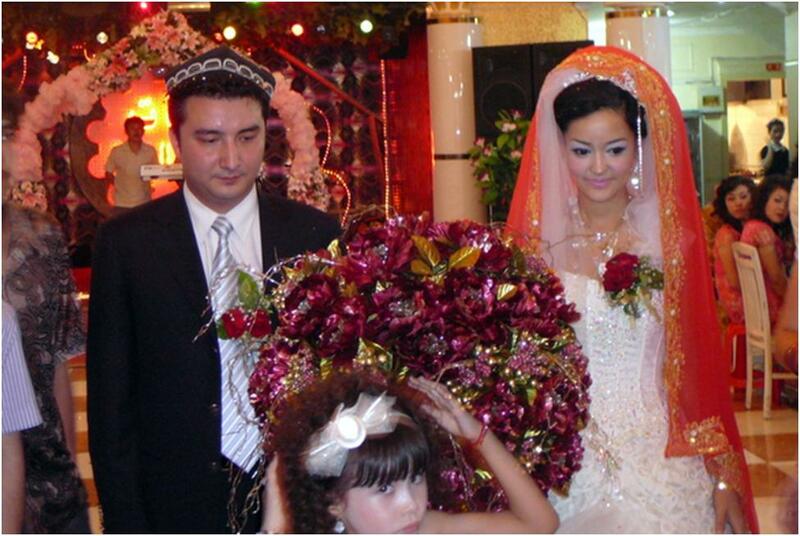 It makes me so sad to see this part of Uyghur culture fall victim to fear and the resulting tightening restrictions. Agreed, Mike…had I known how hard it is to get these knives out of the region, I would have shipped a whole box out a few years ago! Been watching you Youtube Channel. I have been considering accepting a position in Xinjiang. Take care. Im still traveling with it, but I might send it home through kyrgyzstan ! Hello Josh, thank you for the nice article. I’m thinking about going to Kashgar/Yengisar. I would like to buy 4-5 Knifes for family and friends. Is it possible to ship it to Germany from Yengisar/Kashgar? Hi Daniel! Glad you’ll be making the trip. Honestly, I don’t know if you can ship the knives back. I had a hard time shipping them back to Urumqi (the capital of Xinjiang) and I’ve been told that they can’t do international shipping. It’s worth a try!